Knitting doesn’t do a body good. It’s quite good for the brain and the soul, but months of satisfying winter knitting, along with the chocolate that fuels the knitting, has left me tipping toward the rotund. If one spends all one’s time playing with yarn, there just isn’t time for hours of fartleking over woodland trails, tempo runs, intervals, lsd’s, and all the other rot required to stay in peak physical condition. So, last week, I put down the needles and began spring training. The first week went fairly well (20 miles). This week has been tough, but today I was inspired by the sight of a bald eagle soaring low over the lake. It looked free and mighty. My spirits rose. For awhile, all burdens fell away. I was light on my feet. Small birds twittered in the bush, and I remembered that spring rabbits would soon be hopping down the bunny trail. Ah, bunnies, birdies, and eagles soaring low…RUN, BUNNIES, RUN!!! Well, that’s the circle of life. 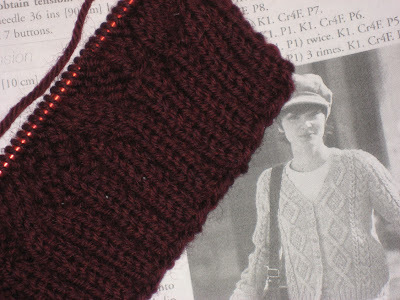 Today, I cast on the sleeve of the Must Have Cardigan (in Patons Street Smart booklet). I wouldn’t have thought of knitting it, but the stitches looked so great on Stephanie Pearl-Mcphee’s blog, that I decided to do a knit-along with her. I hope that’s not creepy, or anything, doing an unsolicited knit-along.